The rise of Daesh in Syria and Iraq, and the spread of Daesh and Al Qaeda affiliated groups throughout the Middle East and North Africa, has resulted in a great deal of harm done to uncountable numbers of objects of enduring cultural value. The damage is being done in two principle ways. First, these groups are destroying cultural sites, libraries, archives, and museums because they deem these sites to be affronts to the society they are attempting to create. There are several examples that have been reported, such as the Al Mahdi case in Mali, the destruction of the library at the University of Mosul, and the numerous cultural heritage sites, including Palmyra and Nimrud, that have been destroyed by Daesh. The second way damage is being done is via looting of cultural heritage objects that are then sold to collectors, sometimes by seemingly reputable dealers, in order to finance terrorist groups. Just this week, on March 26, two Spanish antiquities dealers, one named as Jaume Bagot and one yet unnamed, have been arrested and charged with financing terrorist activities by providing a licit front for the illegal sale of antiquities looted from Libya and Egypt. A great deal of news is still coming out of Spain about this subject and the story will be developing over the next several months. Various governmental organizations, national and international, have recently been addressing the problem of looted cultural artifacts being used to fund terrorist activities. US Homeland Security and law enforcement and prosecutors in New York have made strides to combat looted antiquities trafficking resulting in several seizures of materials already. The UN and EU hosted a conference on March 20-21 entitled, “Engaging the European Art Market in the fight against the illicit trafficking of cultural property” to develop a cooperative approach with players in the art and antiquities markets in Europe to stem looting from conflict zones. The EU has also proposed new restrictions on the import of antiquarian books, prints, and manuscripts in an effort to combat smuggling of looted materials (links to a PDF). Some groups, including ViaLibri and the International League of Antiquarian Booksellers have expressed their concerns over the proposed regulations because of the consequences to the licit rare books and manuscripts trade. These points of view are something for those interested in combating looting to consider if there is an effort to have a cooperative approach to stemming the flow of smuggled goods through international art and antiquities markets. The body of research about cultural property destruction in the name of terrorism is rapidly growing and one can find a great deal that has been produced in the last 3-5 years. 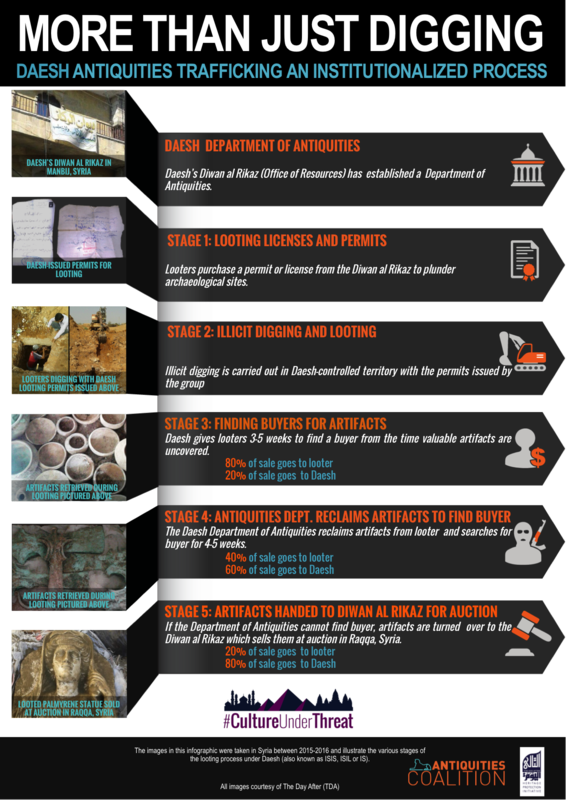 One particular source is the Antiquities Coalition, an NGO with a mission to combat “cultural racketeering.” They recently featured a three part blog series about the trade in looted antiquities. 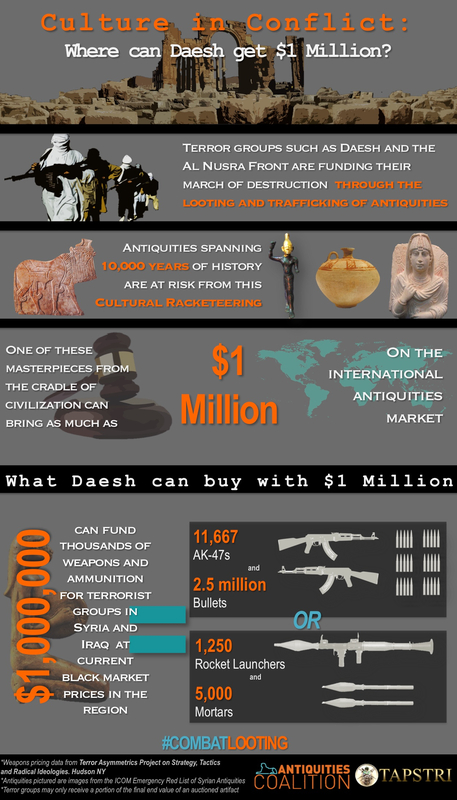 They also have a variety of resources for those interested in combating crimes against cultural heritage, including infographics with jarring statistics about how much Daesh and similar groups can finance with just a few sales of looted artifacts and how the process of looting and garnering money from the proceeds was institutionalized by Daesh as a formal operation of their group. The Antiquities Coalition is certainly not the only source of information. They are one of many that archivists, special collections librarians, and those who work with cultural heritage should be aware of. By being aware of how different groups across the globe are fighting against the illicit trafficking of cultural heritage objects, we can contribute to the effort and ensure that our institutions know the provenance of the cultural heritage objects we are acquiring. Trust is a Security Issue. And a Donor Issue. And a Researcher Issue. Use of the SAA logo by an SAA component group does not necessarily imply SAA endorsement of the groups' statements, positions, or opinions.